Pictures of the front, rear and insides of an LC630. 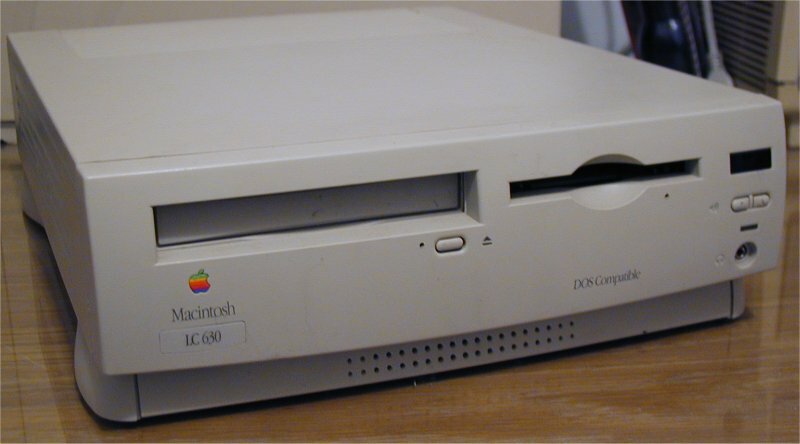 The LC630, or Quadra 630, or Performa 630/630CD/631CD/635CD/636/636CD/637CD/638CD/640CD was the last of the Quadra line. Having a slick 33mHz '040, the 630 was quite a nice machine - it was also the first Apple to have an IDE bus, to support its internal IDE hard disk. Production started in 1994 and ended in late '95. 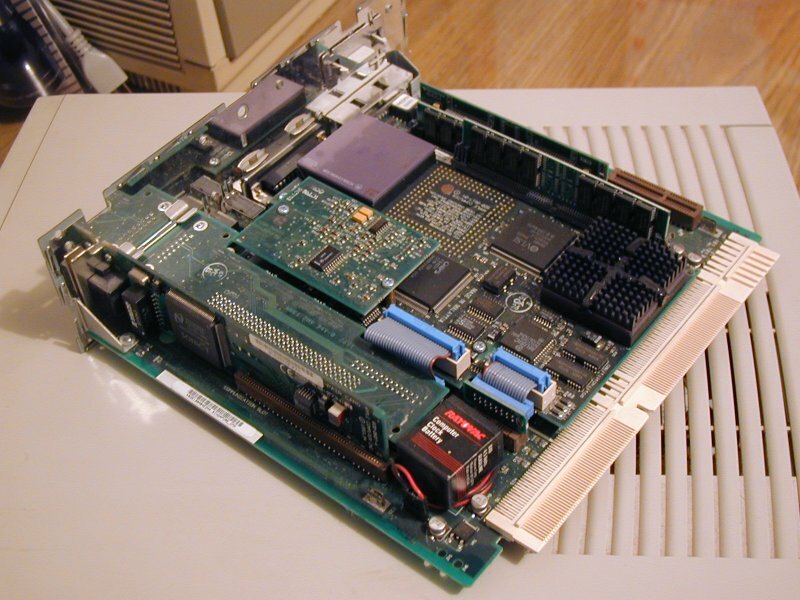 Up to 40MB of memory total, a CDROM drive, TV and video I/O ports, external SCSI and up to 832x624 video. My particular 630 is a 'DOS Compatible' model, which is another name for a Mac with an internal x86 processor card. No, I'm not kidding. The 630DOS has a daughter-card plugged into its the normal '040 processor socket, and sitting on the daughter-card is both the '040 and a 66mHz Cyrix 486 DX-2. The 486 has its own memory slots using 72 pin SIMMs, a joystick port on the back and a Creative Vibra16 sound card. With this optional extra you could run Windows 3.11 and do all your work in Windows on the same machine. The above picture of its insides shows the mainboard pulled out. If you look closely you can see two rows of 72 pin memory SIMMs (one for the Mac, one for the x86). Higher up on the daughter-card is the purple 68040 processor, towards the back of the mainboard is the heat-sinked Cyrix. The piggy-back card off the daughter-board (to the right of the two blue IDC connectors) is the Vibra16 sound card. Upside-down beside the Vibra16 is the card the joystick port is off, and then closest to the camera, standing upright is the 10bT ethernet card.